Gaza’s Hamas government is set to demolish 40 houses in central Gaza city, nearly one year after a court ruled the neighborhood to be public property. Bulldozers were stationed Wednesday outside the homes of nearly 75 families in al-Rimal neighborhood. Many of whom are Palestinian refugees displaced by Israel in 1948. Demolitions are expected to take place later in the day. Meanwhile, scores of residents staged a demonstration against the decision outside Palestinian Legislative Council offices. “This is a great injustice, an act of persecution and a forceful imposition of Hamas’s own version of laws on refugees,” resident Hazem Abu Hmeid told Al-Akhbar. Families will be given $1,000 each in compensation, and have been allotted pieces of land near Gaza’s borders. Abu Hmeid says the government’s remuneration “falls very short” of the money invested in their houses. He says that he has invested over $50,000 in his house. The government, however, claims that the families had agreed to the package over negotiations Tuesday night. “We will no longer accept violations against public property, no matter how long they have been going on for … we want to assure people that we respect human rights for decent living and finding suitable living situations for the families,” read a statement from the Gaza government. “We emphasize the extreme importance we place on not abandoning the families whose houses will be removed to the streets,” it added. Al-Rimal neighborhood lies in a busy commercial area where property values are among the highest in the coastal strip. Many residents expect the government to open the area up to lucrative investments. In its Weekly Report On Israeli Human Rights Violations in the Occupied Palestinian Territories for the week of 23- 30 January 2013, the Palestinian Center for Human Rights (PCHR) found that a Palestinian woman was killed by Israeli forces north of Hebron, and a Palestinian child died of previous wounds he had sustained in ‘Ayda refugee camp, north of Bethlehem. 3 Palestinian civilians were wounded by the Israeli forces in the south of the West Bank. 6 Palestinian civilians, including 2 children, were wounded by the Israeli forces in border areas in the northern Gaza Strip. The Israeli forces continued to use excessive force against peaceful protests in the West Bank. 5 Palestinian civilians, including 2 children, were wounded. In the West Bank, on 23 January 2013, in excessive use of force, the Israeli forces killed a Palestinian woman and wounded another one north of Hebron. According to investigations conducted by the Palestinian Centre for Human Rights (PCHR) and eyewitnesses’ accounts, at approximately 14:00 on Wednesday, an Israeli car (white Toyota Corolla) was traveling near the main road known bypass road #60 close to al-Arroub Agricultural College in Hebron. Two Israeli soldiers in the military uniform were traveling in the car. A number of Palestinian boys who were in the area threw stones at the car, which immediately stopped near the sub-entrance of the College that has been closed for several years by the Israeli forces using an iron gate. One of the soldiers stepped down from the car and indiscriminately opened fire from a machine gun at the branch road leading to the College. As a result, Lubna Moneer al-Hanash, (21), from Jabal al-Mawaleh village east of Bethlehem, was killed by a bullet to the head, and Su’ad Kahlil Ja’ara, (37), was wounded by a bullet to the left hand. Both women were on the branch road nearly 50 meters away from the abovementioned bypass road. The two women were evacuated to the National Hospital in Hebron. Soon after, the Israeli forces and police arrived at the scene and declared the area a closed military zone. A number of residents of al-Arroub refugee camp, which is nearly 200 meters away from the scene of the crime and clashed erupted between them and the Israeli forces, which fired tear gas canisters and sound bombs. A number of civilians suffered from tear gas inhalation. On the same day, a Palestinian child of wounds he had sustained on 18 January 2013. According to investigations conducted by PCHR, at approximately 14:30 on Friday, 18 January 2013, dozens of boys and children gathered at the eastern entrance of ‘Ayda refugee camp, north of Bethlehem, and threw stones at the Israeli soldiers positioned inside the watchtower in the vicinity of Belal Ben Rabah Mosque (Rachel Tomb), north of the town. The Israeli forces later positioned at the main entrance of the camp and started firing sound bombs and tear gas canisters at the demonstrators and opened fire at them. As a result, al-‘Amareen was wounded in the head and was transported to Beit Jala Public Hospital to receive treatment. Due to his serious condition, the aforementioned child was transferred to Hadasa “Aein Karim” where he stayed till they declared his death on the above-mentioned day. On 25 January 2013, a Palestinian civilian was wounded by shrapnel from a sound bomb southeast of Hebron. At approximately 17:30, after declaring the death of Saleh al-‘Amareen of his wounds sustained during the clashes, which broke out in the vicinity of Belal Ben Rabah Mosque at the entrance of Bethlehem on 18 January 2013, dozens of young men gathered at the entrance of al-‘Aeza refugee camp, north of the town, and started throwing stones and empty bottles at the Israeli soldiers positioned in the vicinity of the aforementioned mosque. The Israeli soldiers immediately fired tear gas canisters, sound bombs and rubber-coated metal bullets at the demonstrators and then moved towards the entrances of the camp amidst shooting. As a result, some of the demonstrators suffered from tear gas inhalation and received treatment on the spot, except Mohammed Maher ‘Amarnah, (21), from al-Dheisha refugee camp, south of the town, as he suffered from severe gas inhalation and was transported to Beit Jala Public Hospital. Eyad Sho’aeib Sa’aid Abu Sha’aira, (22), was injured in his right foot with a gunshot and was transported to Beit Jala Governmental hospital. Ahmed ‘Alian al-Qadi, (24), was also hit by a tear gas canister in the head and was then transported to Bethlehem Arab Society for Rehabilitation where his injuries were described as serious. During the last week, the Israeli forces conducted 75 incursions into Palestinian communities in the West Bank. At least 33 Palestinian civilians, including 5 children, were abducted during those incursions. The Israeli forces established dozens of checkpoints in the West Bank. At least 11 Palestinian civilians, including 2 children and an old woman, were abducted at checkpoints in the West Bank. Israel has continued efforts to create a Jewish majority in East Jerusalem. 2 rooms and some other civilian facilities were demolished in Silwan village. The Israeli naval forces continued to fire at Palestinian fishing boats in the Gaza Strip. On 23 January At approximately 06:15, the Israeli gunboats stationed off al-Waha resort in the northern Gaza Strip opened fire heavily at Palestinian fishing boats for 15 minutes at a distance of 5 nautical miles off the shore. As a result, the fishermen were frightened and fled for fear of being abducted or wounded. Neither casualties nor material damage were reported. At approximately 08:40, the Israeli forces moved nearly 200 meters into al-Qobtania area, southeast of Beit Hanoun, in the northern Gaza Strip. They leveled lands adjacent to the border fence between the Gaza Strip and Israel, amidst sporadic shooting. As a result, the farmers and bird hunters, who were in the vicinity of the aforementioned area, were frightened and fled for fear of being wounded. At approximately 14:30, the Israeli forces withdrew from the area and neither casualties nor damages were reported. 5 Palestinian civilians, including 4 children, were abducted in the Gaza Strip. Israel has continued settlement activities in the West Bank and Israeli settlers have continued to attack Palestinian civilians and property. On 24 January 2013, the Israeli forces handed notices to 5 number of Palestinian civilians to stop the construction work in their houses in al-Zbidat village, north of Jericho, under pretext that they are not licensed. On the same day, Israeli forces bulldozed two houses built of stone, wood and tin, three tents and three cattle barns in Abu-‘Ajaj area, in al-Jiffitlek village, north of Jericho. On 25 January 2013, dozens of Israeli settlers coming from “Beit Hagai” settlement, established on Palestinian land southeast of Hebron, raided the Palestinian farmlands near Deir Razeh village, east of Doura, southwest of Hebron. On the same day, dozens of settlers coming from “Kharsina” settlement outpost, established on Palestinian lands east of Hebron, stormed al-Hussain Valley area. They attacked a Palestinian civilian by spraying tear gas on his face. Later, a large Israeli forces unit raided the area and abducted the civilian and transported him to an unknown destination. On the same day, At approximately 10:00 on Friday, a group of settlers coming from “Eliezer” settlement, under the protection of the Israeli forces, planted olive seedlings in Khelat al-Fahem area, south of al-Khader village, located between “Eliezer” and “Gosh Atsion” settlements, on the lands of Palestinian civilians from al-Khader village. On 26 January 2013, Israeli forces denied farmers from the Awad family and a number of international human rights activists from reaching the farmlands, which are threatened of confiscation in Qwaywees, east of Yatta, south of Hebron, under pretext that these lands are a closed military zone and civilians are prohibited from entering. On 28 January 2013, Israeli forces stopped Palestinian farmers of al-Nawa’ja family from accessing their farmlands, adjacent to one of the Israeli forces’ military camps in Susiya area, southeast of Yatta, south of Hebron. The farmers were going to plant the land with olive trees. The soldiers detained a number of the Palestinian civilians for a number of hours before releasing them. On 29 January 2013, Israeli forces, accompanied by military vehicles and a vehicle of the Israeli Civil Administration, raided al-Tabban area, east of Yatta, south of Hebron. They handed 7 notices for stopping the construction work on 4 houses, which he occupies along with 33 members of his family, 3 barracks used for raising cattle and storing fodders and grain. Israeli forces continued to systematically use excessive force against peaceful protests organized by Palestinians and Israeli and international activists against the construction of the annexation wall and settlement activities in the West Bank. As a result, 5 civilians, including 2 children, were wounded. Besides, dozens of Palestinians suffered from tear gas inhalation or sustained bruises. During the reporting period, Israeli forces used force against peaceful demonstrations organized by Palestinian civilians and international and Israeli human rights defenders in protest at the construction of the wall and settlement activities in the West Bank. As a result, 5 Palestinian civilians were injured, including two children. Four of them were wounded in the Bil’ein weekly peaceful demonstration, including a child, a member and a photographer of the Popular Committee against the Wall and the Settlement Activity in Bil’ein and an Israeli solidarity activist, while a child was wounded in Nabi Saleh weekly demonstration. Following the Friday Prayer on 25 January 2013, dozens of Palestinian civilians and international and Israeli human rights defenders organized a peaceful demonstration in Bil’ein village, west of Ramallah, in protest to the construction of the annexation wall. The demonstrators gathered in the streets of the village, chanting slogans calling for national unity. The protesters aimed to stress the need to adhere to national principles and the right of return, to resist the occupation and to call for the release of all Palestinian prisoners. The protesters raised Palestinian flags and made their way towards the lands adjacent to the annexation wall. The Israeli forces closed all ways and entrances to the village since early morning hours, to prevent Palestinians, journalists and international activists from joining the protest. The protesters raised Palestinian flags and made their way towards the wall. They called through megaphones for Israeli settlers in “Mitityahu” settlement to leave Palestinian land. Israeli soldiers stationed in the area fired rubber-coated metal bullets, sound bombs and tear gas canisters at the demonstrators. As a result, 4 demonstrators sustained wounds, a child, a member and a photographer of the Popular Committee against the Wall and the Settlement Activity in Bil’ein and an Israeli solidarity activist. Also dozens of demonstrators suffered from tear gas inhalation and others sustained bruises. Also following the Friday Prayer on 25 January 2013, dozens of Palestinian civilians and international and Israeli human rights defenders organized a peaceful demonstration in Ne’lin village, west of Ramallah, in protest at the construction of the annexation wall and settlement activities. The demonstrators moved towards areas of the annexation wall. Immediately, Israeli soldiers stationed in the area fired rubber-coated metal bullets, sound bombs and tear gas canisters at the demonstrators. As a result, dozens of demonstrators suffered from tear gas inhalation and others sustained bruises. Around the same time on Friday, 25 January 2013, dozens of Palestinian civilians and Israeli and international human rights defenders gathered in the Martyrs Square in Nabi Saleh village, northwest of Ramallah, to hold a weekly peaceful protest against the construction of the annexation wall and settlement activities, entitled: “In support of the prisoners on hunger strike in the Israeli prisons.” The protesters walked towards the gate erected by Israeli forces near the entrance of the village, which leads to Palestinian lands that Israeli settlers from the nearby “Halmish” settlement are trying to seize. Israeli soldiers fired live and rubber-coated bullets, sound bombs and tear gas canisters at the protesters. As a result, a 17-year-old child was hit by a tear gas canister to the head and dozens of demonstrators suffered from tear gas inhalation and others sustained bruises. At the same time on Friday, dozens of Palestinian civilians and international human rights defenders gathered in Budrus village, west of Ramallah and al-Bireh, for a peaceful protest against the annexation wall and settlement activity. The demonstration was entitled: “In memory of the Killing of Samir Amed Awad.” The settlers walked through the village streets and headed towards the wall. The Israeli forces closed the wall gates with barbered wires, and when the demonstrators attempted to cross wall to the land behind it, the forces stopped them and so the demonstrators threw rocks at them. The Israeli soldiers fired tear gas canisters and rubber-coated bullets. As a result, dozens of demonstrators suffocated from tear gas inhalation. At approximately 12:15 on the same Friday, dozens of Palestinian civilians and international human rights defenders organized a peaceful demonstration in the center of Kuffor Kadoum village, northeast of Qalqilya, in protest to the continuous closure of the eastern entrance of the village since the outbreak of al-Aqsa Intifada. The demonstrators moved towards the entrance of the village. Immediately, Israeli forces, stationed in the surroundings of the steel gate established at the entrance, fired tear gas canisters and sound bombs at them. No injuries were reported. After the Palestinian Minister of Prisoners Affairs, Mr. ‘Issa Karake’, declared the PNA’s intention to build a village for the prisoners released from the Israeli jails on Palestinian civilians’ lands west of ‘Anin village, to the west of Jenin, and called it Kasser al-Kaid village (Breaking the chains), at approximately 15:30 on Friday, 25 January 2013, Mr. Rabah Roshdi Abdallah Yassin (49), owner of the land, accompanied by the head of the village council and a number of the village’s youths and a digger, went to prepare the land for erecting tents on it the next day. Immediately after arriving to the land, Israeli forces arrived at the scene and stopped them from working. At approximately 14:30 on Saturday, 26 January 2013, the Israeli forces declared ‘Anin village a closed military zone, and deployed its soldiers in the village, accompanied by a number of military vehicles. They were also stationed at the village’s gate, and denied a number of Palestinian officials from entering the village, including the Mayor of Jenin, the Minister of Prisoners Affairs and Jammal Howail, member of the Palestinian Legislative Council (PLC). Moreover, dozens of journalists and human rights activists and representatives of legal organizations were denied entry as well. Later, the Palestinian officials and the human rights activists gathered at the eastern entrance of the village, while the youth of ‘Anin village gathered at the western entrance. Young men threw the Israeli soldiers with rocks and empty bottles. Immediately, the Israeli soldiers fired sound bombs and tear gas canisters at the crowd; as a result, dozens of them suffered from tear gas inhalation. The Israeli soldiers also beat Mr. Jamal Howail after engaging in a skirmish with them. Palestinian civilians Ahmed (24) and Yousif (32) Sha’ban Shafe’ Yassin were abducted while trying to leave the village and join the gathered demonstration at the village’s entrance. At approximately 11:30 on Saturday, 26 January 2013, dozens of Palestinian civilians, international and Israeli human rights defenders, gathered in the Center of Bait Ummar village, north of Hebron, for the weekly peaceful demonstration organized against the settlement expansion policy, the wall and the arrest of children. The demonstrators headed towards the confiscated farmlands near the security fence of “Kermi Tsour” settlement, east of the village. A group of Israeli soldiers surrounded the demonstrators and fired sound bombs and tear gas canisters at them; as a result, dozens of participants suffered from tear gas inhalation. The soldiers also assaulted a number of the demonstrators by kicking and punishing them. The assaulted demonstraters were identified as: Moussa Abdel-Hamid Abu-Maria (44) and Ahmed Abu Hashim (45). The Israeli soldiers detained an Israeli solidarity activist, and released him later. On Tuesday, 29 January, Saber al-Zaa’anin, Coordinator of the local initiative in Beit Hanoun and who supervises on such solidarity activities with the Palestinian farmers who are subjected to shooting by Israeli forces. At approximately 10:20, al-Zaa’anin, accompanied with 8 foreigner solidarity activists and 14 Palestinian solidarity activist from the local initiative in Beit Hanoun, went to al-Ba’a farmland to help farmers harvesting their crops. Only moments before finishing their job, a number of Israeli soldiers got out of their jeep to position at the eastern border fence and started directly shooting at them. As a result, they were all frightened and forced to flee for fear of being injured. No injuries were reported. Due to the number and severity of Israeli human rights violations this week, the PCHR made several recommendations to the international community. Among these were a recommendation that the international community pressure Israel to lift the severe restrictions imposed by the Israeli government and its occupation forces on access for international organizations to the Occupied Palestinian Territories. The PCHR reiterates that any political settlement not based on international human rights law and humanitarian law cannot lead to a peaceful and just solution of the Palestinian question. Rather, such an arrangement can only lead to further suffering and instability in the region. Any peace process or agreement must be based on respect for international law, including international human rights and humanitarian law. The Palestine Public Broadcasting Cooperation reported Tuesday that Israel started the new year with a series of invasions, attacks and destruction of Palestinian property, and with arrests targeting local residents; injuries were also reported. The army invaded the Al-Esawiyya town, north of occupied East Jerusalem, and demolished a home that belongs to resident Rafat Tareq Al-Eesawy, 40, under the pretext that his home was built without a construction permit. Rafat is the brother of detainee Samer Al-Eesawy, who went on hunger strike more than 176 days, and suspended his strike last week for ten days following medical advice due to very serious health complications. He said that Israeli military bulldozers, and several armored military vehicles, invaded Al-Esawiyya and demolished his 145-square/meter under construction home. The army and the Jerusalem municipality never handed him and warning, warrant or citation regarding his property. “Israel regards the land we live on to be public property, and wants to use the area to build national and biblical gardens”, he said, “therefore, the city council does not grant the Palestinians any construction permits, I’ve been living in my small house with the three children and wife for 10 years, I cannot expand my house, I cannot build another house for my children due to Israeli restrictions”. The army also demolished, on Tuesday morning, three hothouses that belong to two families in the village, also under the pretext of being constructed without permits. It is worth mentioning that since early dawn hours of the first day of 2013 the army conducted various invasions into different parts of the occupied West Bank, broke into several homes and kidnapped a number of residents. The soldiers invaded Beit Fajjar, south of Bethlehem , broke into and searched several homes before kidnaping two residents identified as Amer Mohammad Taqatqa, 20, and Mousa Na’im Taqatqa, 19. Soldiers further invaded Beit Ummar and Sa’ir towns, in the Hebron district in the southern part of the West Bank, kidnapped four residents and installed several roadblocks. The Palestine New and Info Agency (WAFA) reported that the soldiers kidnapped Nour Yousef Awad, 18, Mohannad Mirshid Awad, 15, and Yousef Ibrahim Sabarna, 18, after breaking into and searching their homes in Beit Ummar, and also kidnapped Adham Jaradaat, 27, in Sa’ir town. The army further invaded several neighborhoods in Hebron, installed roadblocks at the entrances on Sa’ir, Halhoul, Ithna, and the Al-Fawwar refugee camp, stopped and searched dozens of vehicles and interrogated dozens of residents while inspecting their ID cards. In occupied Jerusalem, the army kidnapped Amer Ziad Zeidani, 17, Samah Maher Sahran, 19, and Ibrahim Mouse Odah, 23, after invading Silwan town, south of the Al-Aqsa Mosque. Majdi Al-Abbasy of the Wadi Hilweh Information Center told the WAFA News Agency that the army kidnapped the three residents from their homes in Ayyoub and Al-Bustan neighborhood, and moved them to an interrogation center in the city. In Jenin, in the northern part of the occupied West Bank, the army kidnapped three children from Zabbouba village, and held them at the Salem military camp, and also invaded the nearby villages of Az-Zababda and Msalya villages, south of the city. Local sources told WAFA that the army detained Mohammad Jaradaat, 15, Allam Maqalda, 16, and Ahmad Amarna, 16, after invading Zabbouba village, interrogated the three children for several hours and handed them to the Palestinian District Coordination Office. In Tammoun village, near the central West Bank city of Tubas, five Palestinians have been injured by military fire, one seriously, after undercover forces of the Israeli army infiltrated into the village and broke into a home before kidnaping one resident identified as Morad Suleiman Bani-Odah. Head of the Tammoun village council told WAFA regular units of the Israeli army invaded the village and clashed with local residents; the soldiers fired dozens of rounds of live ammunition wounding five residents identified as Dia’ Bani-Odah, Jadallah Jaradaat, Mohammad Bisharaat, Anas Bani-Odah, and Amin Bani-Odah’’ dozens of residents were treated for the effects of teargas inhalation. The South African Christian delegation included the Presiding Bishop of the Methodist Church in Southern Africa, Bishop Zipho Siwa; the General Secretary of the Presbyterian Church in Southern Africa and President of the World Communion of Reformed Churches Southern Africa, Reverend Jerry Pillay; the Secretary General of the Evangelical Alliance of South Africa,Reverend Moss Nthla; and the Deputy Moderator of the Dutch Reformed Church, Dominee Braam Haanekom. “The Palestinians [Christians as well] are asking the world for economic, cultural and other forms of boycott, divestment and sanctions (BDS) – a strategy that helped us to end apartheid in South Africa. We believe that maximum pressure must be put on Israel to abide by international law.” Click here for the full statement, photos and further info. The Jewish Chronicle reported that Baroness Sayeeda Warsi has complained to the Deputy High Commissioner for Human Rights about Richard Falk’s posting of an “unacceptable” cartoon on his blog. Richard Falks, a Jewish Professor of Law at Princeton believes that transformation of the Palestine/Israel situation will come about through the campaigns and actions of civil society, including boycotts. The lady clearly needs some help in understanding the cartoon and why it is acceptable and appropriate. What is it that you don’t get about Richard Falk’s posting of a cartoon and of his call for a boycott of Jewish Settlement companies? protective garment, is peeing on the Statue of Justice. Deprivation of Justice is inseparable from deprivation of Liberty. Israel has for decades, with USA aid, continued an illegal military occupation of Palestine. 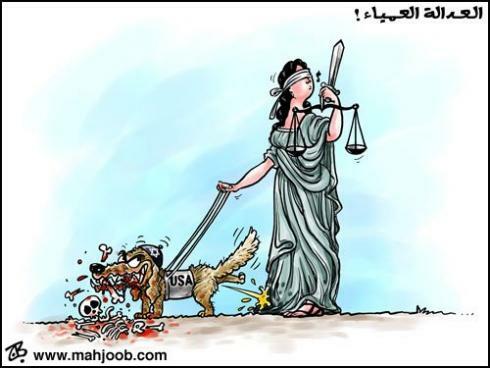 (An offence against Justice and the Liberty of Palestinians). The State of Israel illegally imprisons and frequently tortures 7,000 Palestinian children a year. (Unjust to those youngsters and their families and an offence against Palestinian Liberty). Richard Falk, a kindly and just man, gets a little upset about his fellow human-beings, especially small children, suffering privation, unwarranted misery and death. (Hence the dog chewing up the bones of humans). As a good Jew, he knows from personal experience that much of Israeli and World Jewry, among many others, supports the above malign system and that some are even financially benefitting from it. He gets upset at the injustice of Jews and their friends building houses, colleges, universities and companies on stolen land, selling and buying goods manufactured illegally on another people’s land. This tender-hearted Jew has therefore asked decent people around the world not to buy goods derived from stolen Palestinian land. He feels that to do so is to support a malign and illegal system and to show disrespect for the rule of Law. He knows that Peace can never grow on such rotten soil. I do hope the above explanation helps. Across historic Palestine – Israel, the West Bank, and Gaza – the State of Israel rules over around 12 million people whose rights and privileges are determined on a discriminatory basis. A POLL OF JEWISH ISRAELIS published last week in Ha’aretz newspaper created headlines round the world with its findings of support among the public for discriminatory policies. Some greeted the survey’s results as vindication of claims made by critics of the Jewish state; others pointed to what they said were flaws in the methodology and how the statistics were being presented. There is, however, no need for such a poll in order to reach the conclusion that Israel is guilty of apartheid: The facts speak for themselves. Firstly, a clarification about terminology. To talk about Israeli apartheid is not to suggest a precise equivalence with the policies of the historic regime in South Africa. It is impossible to understand this “system” without remembering that its foundations were laid by the ethnic cleansing that took place in the Nakba. With the establishment of Israel in 1948, up to 90 per cent of the Palestinians who would have been inside the new state were expelled, their properties confiscated, and their return prevented. As these refugees were denied citizenship and their right to return ignored, Israel passed legislation to open up the new borders to Jews everywhere. Thus the only reason why Israel, a so-called “liberal democracy”, has a Jewish majority at all is because of the forced – and ongoing – physical exclusion of Palestinians from their homes. From 1948 to 1953, 95 per cent of new Jewish communities were established on expelled Palestinians’ property. The amount of land belonging to Palestinian refugees expropriated by Israel’s “Absentee Property Law” amounts to around 20 per cent of the country’s total pre-1967 territory. Today, around one in four Palestinians with Israeli citizenship are “present absentees”, their homes and land confiscated. By the mid-1970s, the average Arab community inside Israel had lost around 65 to 75 per cent of its land. Since 1948, over 700 Jewish communities have been established inside Israel’s pre-67 borders – but only seven for Palestinian citizens (and those in order to concentrate the Bedouin population in the Negev). Meanwhile, tens of thousands of Bedouin citizens live in dozens of “unrecognised villages”, mainly in the Negev (though “non recognition” is not restricted to the south). They suffer from home demolitions and a lack of basic infrastructure. A serious new threat is the Prawer Plan, with planned mass evictions threatening up to 70,000 with forced relocation and the destruction of their villages. This planned ethnic cleansing is driven by the sort of anxiety Shimon Peres expressed to US officials in 2005, when he worried that Israel had “lost” land in the Negev “to the Bedouin” and would need to take steps to “relieve” the “demographic threat”. A senior official in the Jewish Agency in 2003 explained a new Judaisation initiative on the grounds that “the birthrate of the Bedouins and Arabs in the Galilee is much faster than the Jewish” and thus “we are quickly losing our majority there”. Another element in this regime of ethnic privilege is admissions committees, which operate in around 70 per cent of Israeli towns and permit (or deny) residency on the basis of social “suitability”. By “rejecting applications” from Palestinian citizens, the committees “have notoriously been used to exclude Arabs from living in rural Jewish communities” (Human Rights Watch). Their role is now legislated for in around 42 per cent of communities, and those supporting the law were not shy to express their motivations. MK Israel Hasson (from the “centrist” Kadima party) said the law’s purpose is to “preserve the ability to realise the Zionist dream in practice”, while MK David Rotem (from FM Lieberman’s party Yisrael Beiteinu), said Jews and Palestinians should be “separate but equal”, affirming that “Israel is a Jewish and democratic state, not a state of all its citizens”. Israel’s institutionalised racism has serious consequences even for Palestinians’ choices about who to marry. In January, the High Court – a forum praised by “liberal” defenders of Israeli apartheid – upheld a law severely restricting Israeli citizens’ ability to live with spouses from the West Bank and Gaza. In the majority opinion, Justice Asher Grunis wrote that “human rights are not a prescription for national suicide” – referring to the “demographic” spectre that haunts apartheid regimes. Kadima MK Otniel Schneller praised the decision for “articulat[ing] the rationale of separation between the peoples and the need to maintain a Jewish majority and the [Jewish] character of the state”, linking this to the formulation “two states for two peoples“. Ironically, this slogan of Zionist “moderates” (yes, it’s all relative) echoes the rhetoric of Apartheid South Africa’s politicians, who warned that “either we must follow the course of equality, which must eventually mean national suicide for the white race, or we must take the course of separation”. The room for dissent is limited. In 2007, Israel’s internal security agency the Shin Bet stated it would “thwart the activity of any group or individual seeking to harm the Jewish and democratic character of the state of Israel, even if such activity is sanctioned by the law”. In 2008, the agency’s then-chief told US officials that many of the “Arab-Israeli population” are taking their rights “too far”. Israeli law provides for the banning of electoral candidates who deny “the existence of the State of Israel as the state of the Jewish people”, and proposed bills can be rejected on the grounds that they undermine “Israel’s existence as the state of the Jewish people”. While the Ha’aretz survey shocked some, it should not come as a surprise: Such views often emerge in similar polls. Examples in recent years include over half of Jewish Israelis saying marriage to an Arab is “equal to national treason“, 78 per cent of Jewish Israelis opposing Arabs joining the government, 62 per cent of Jewish Israelis encouraging the emigration of Palestinian citizens, and 36 per cent of Jewish Israelis being in favour of revoking the voting rights of non-Jews. Such results are entirely expected when you look at the discourse propagated by Israel’s leaders. PM Netanyahu, as finance minister in 2003, described Palestinian citizens as a “demographic problem”, while in 2009, the current Housing Minister declared it a “national duty” to “prevent the spread” of Palestinian citizens. In 2010, the chair of the Knesset’s “Lobby for Housing Solutions for Young Couples” stated that “it is a national interest to encourage Jews to move to” places where “the Arab population is on the rise”. When Ehud Olmert was mayor of Jerusalem, he considered it “a matter of concern when the non-Jewish population rises a lot faster than the Jewish population”. The same racist logic is behind the kinds of warnings issued by PM Netanyahu that “illegal infiltrators” – non-Jewish African refugees and migrants – could threaten the country’s existence “as a Jewish and democratic state”. In other countries, this is the language of the fringe far-Right; In Israel, to discuss the “threat” posted by Palestinian citizens and other non-Jews is routine. And what of Israeli policies in the Occupied Territories, under military rule for 45 years? In Jerusalem, constantly touted by Israel’s leaders as the country’s “eternal” capital, Palestinian residents in the illegally annexed East face planning restrictions, home demolitions, discrimination in municipal services, and the community-shattering Apartheid Wall. Speaking to BBC’s Hardtalk in July 2011, Mayor Barkat openly confirmed that he seeks to maintain a Jewish majority in the city – imagine if the mayors of London, New York or Paris stated that Jewish residents must not rise above a certain proportion. There are over 300,000 Israeli citizens living in West Bank settlements (plus 200,000 in East Jerusalem), a network of colonies among a Palestinian population without citizenship. Palestinians’ freedom of movement is controlled by a bureaucratic “permit” system, enforced by some 500 checkpoints and obstacles. The vast majority of the Apartheid Wall, 700km in length and 70 per cent completed or under construction, lies inside the occupied West Bank. The illegality of this de facto annexation was confirmed by the International Court of Justice (ICJ) in their 2004 advisory opinion. In 60 per cent of the West Bank (“Area C”), Palestinians must apply for building permits from Israeli occupation forces; yet according to a 2008 UN report, 94 per cent of applications are denied. Building illegally means demolition. In 2011, Israel demolished 620 Palestinian-owned structures in the West Bank, part of what the EU has called a “forced transfer of the native population“. Meanwhile, cranes and diggers are put to work in thriving, illegal, Israeli settlements. Israel also exploits the West Bank’s natural resources, such as its “discriminatory” control of water access and usage: Palestinians, over 80 per cent of the population in the West Bank, are restricted to 20 per cent of the water from the main underground aquifer. Human Rights Watch have called Israel’s regime in the West Bank a “two-tier system” where Palestinians face “systematic discrimination” (the same terminology they have used to describe policies inside the pre-67 borders as well). 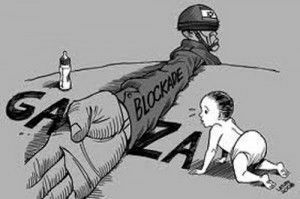 The Gaza Strip, home to some 1.7 million Palestinians a majority of whom are refugees, is blockaded by the Israeli military behind perimeter fences and “buffer zones” (including at sea). Restrictions on movement began in the early 1990s, with an intensified siege being implemented in 2006-’07. Until today, Israel blocks almost all exports from the territory, and pursues what it calls a “separation” policy for the purpose of cutting off Gaza from the West Bank. In March, the UN Committee on the Elimination of Racial Discrimination (CERD) described Israel’s violations of the right to equality in unprecedented terms. Noting “segregation between Jewish and non-Jewish communities” and a lack of “equal access to land and property” inside Israel’s pre-67 borders, CERD found a regime of “de facto segregation” in the West Bank severe enough to prompt a reminder of the “prohibition” of “apartheid”. Lawrence Davidson views Israel’s litany of savage behaviour, from the ethnic cleansing that started in earnest in 1948 and is ongoing to the starvation war waged on Gaza and numerous acts of wanton, petty cruelty. OK. The Israelis were savages in 1948 and only a small minority will admit it. What about after “the War of Independence”? As it turns out the ethnic cleansing never stopped. Conveniently, the long-standing denial that it ever started has helped to hide the fact of its ongoing nature. Yet just this week we received the news that Defence Minister Ehud Barak has given the order to demolish eight Palestinian villages with some 1,500 residents in the south Hebron hills. The excuse offered by Barack is that the land is needed for military training exercises. According to the “new historians”, this is a standard Israeli government cover for ethnic cleansing. Sure, for a couple of years the Israeli army will use the land that held the demolished villages. Then, almost inevitably, the area becomes the site of a new Israeli Jewish settlement. On 20 October 2012 Al-Jazeera reported on Israeli documents showing that between 2008 and 2010 the Israeli army allowed food supplies into the Gaza Strip based on a daily calorie count that held the basic diet of a million and half people to a point just short of malnutrition. According to the Israeli human rights organization Gisha, “the official goal of the policy was to wage economic warfare which would paralyze Gaza’s economy and, according to the Defence Ministry, create pressure on the Hamas government”. Actually, this bit of savagery predates 2008. Back in 2006 Dov Weissglass, then an advisor to Prime Minister Ariel Sharon, stated that “the idea is to put the Palestinians on a diet, but not to make them die of hunger”. Of course, precedents for this can be found in the treatment of European Jews in the 1930s and 1940s. One assumes that Mr Weissglass was aware of this. However, just as with the barbarism practiced in the “War of Independence”, in this case too there is a well practised capacity for national denial. According to Gideon Levy writing in Haaretz, “the country has plenty of ways … of burying skeletons deep in the closet so that Israelis shouldn’t be overly disturbed”. The military authors of the document that turned Weissglass’s hideous “idea” into savage practice, operated in “a country afflicted with blindness”. So, the present Israeli government does not have to worry about public unease over the fact that it is slowly but surely destroying the Gaza sewage system and rendering its water supply undrinkable. Then there are the petty acts of cruelty that can be considered tell-tale signs of savagery. For instance, the fact that Israeli customs officials held back the exam sheets for the October 2012 College Board tests bound for the West Bank graduating high school seniors. AMIDEAST, the organization that serves as the testing agency for the Palestinian territories, had made sure the Israeli authorities had the tests in their hands weeks in advance. Nonetheless, in an apparent act of petty vindictiveness, the customs officials held on to them until AMIDEAST had to cancel the exam. One observer has asked the question: “What has the SAT [tests] have to do with Israeli security?” Well, it might be that, in the mind of a savage customs official, the more college-bound Palestinians from the occupied territories, the more articulate witnesses to Israeli oppression. On the Gaza side of the equation, the US was forced to cancel a small scholarship programme for Gaza college students because the Israelis refused to let the students leave their open air prison, even if only to go to a West Bank school. For anyone who might want to follow the grim procession of Israeli oppressive and barbaric acts on a day to day basis, I recommend the web site “Today in Palestine“, provided by the International Middle East Centre. an immediate investigation into possible violations by Israel of the US Foreign Assistance Act and the US Arms Export Control Act which respectively prohibit assistance to any country that engages in a consistent pattern of human rights violations….We urge Congress to hold hearings to examine Israel’s compliance, and we request regular reporting on compliance and the withholding of military aid for non-compliance. So far, the Congress has turned a deaf-ear to this request, but the Zionist reaction was loud and clear. Leading the way in this effort was the head of the misnamed “Anti-Defamation League” (ADL), Abraham Foxman. Charging the Christian leaders with a “blatant lack of sensitivity” (one might ask just how sensitive one is supposed to be to an oppressor?) Foxman decided to punish the offending clergy by refusing to engage in ongoing “interfaith dialogue”. The Zionist reaction to being called out for their own savage behaviour is a classic example of denial. Having “big brains” is a two edge sword for human beings. It means we can think all manner of creative thoughts and even exercise some self-control over our own inappropriate impulses if we care to try. However, it also means that we can be manipulated into thinking that we need not try – that we are the victims even as we are oppressing others and that any criticism of our actions is just another example of our victimization. Israeli culture, and indeed the culture of Zionism generally, is one ongoing project of self-manipulation to achieve just such a state of mind. And, to a great extent, it has succeeded. A recent poll taken in Israel shows that “a majority of the [Israeli Jewish] public wants the state to discriminate against Palestinians … revealing a deeply rooted racism in Israeli society”. The Zionists are not the only experts in denial. The United States, Israel’s chief ally, has always been good at this gambit as well. After the 9/11 attacks any consideration of the possibility that United States foreign policy in the Middle East might have helped motivate the terrorism was anathema, and it still is over a decade later. Instead of taking a hard look at our own behaviour we are simply expanding our capacity to kill outright anyone who would challenge our policies in a violent fashion. Our answer is targeted killings by drones or otherwise – a bit of savagery we learned from the Israelis. Whoever wishes to foresee the future must consult the past; for human events resemble those of preceding times. This arises from the fact that they are produced by men who ever have been, and ever shall be, animated by the same passions, and thus they necessarily have the same results.